An applicant should file a request for accelerated examination under the Patent Prosecution Highway (PPH) program with Mexico to CIPO by submitting a completed PPH request form and the relevant supporting documents. The PPH request form must be the uppermost document to ensure that the request is correctly processed. The PPH request form is available online at the CIPO PPH website at http://www.cipo.ic.gc.ca/pph/. 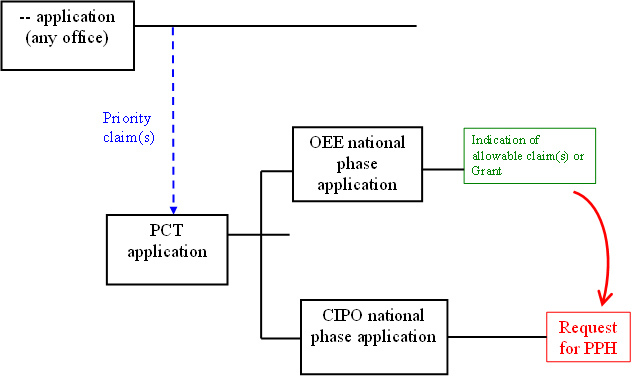 a PCT national phase application where both the CIPO application and the OEE application(s) are derived from a common PCT application having no priority claim. Such "corresponding patent applications" should not be necessarily interpreted as the application which forms the basis of the priority, but might be the application which derived from the application which forms the basis of the priority or the PCT application which has no priority claim; e.g., a divisional application of the application or an application which claims internal priority to the application. Illustrated examples of Canadian patent applications that may request accelerated examination under the PPH at CIPO are given in Annex A. At least one corresponding application in the OEE has one or more claims that are determined to be allowable by the OEE. Applicant should identify the relationship between the OEE application that contains the allowable/patentable claims and the CIPO application. All claims on file, as originally filed or as amended, for examination under the PPH must sufficiently correspond to one or more of those claims indicated as allowable in the OEE. Claims are considered to "sufficiently correspond" where, accounting for differences due to translations and claim format, the claims in the CIPO are of the same or similar scope as the claims in the OEE, or the claims in the CIPO are narrower in scope than the claims in the OEE. In this regard, a claim that is narrower in scope occurs when an OEE claim is amended to be further limited by an additional feature that is supported in the specification (description and/or claims). When possible, the narrower claim on file should be presented in dependent form. A claim in the CIPO which introduces a new/different category of claims to those claims indicated as allowable in the OEE is not considered to sufficiently correspond. 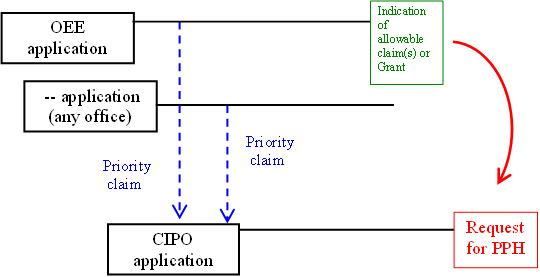 For example, the OEE claims only contain claims to a process of manufacturing a product, then the claims in the CIPO are not considered to sufficiently correspond if the CIPO claims introduce product claims that are dependent on the corresponding process claims. An example of claims on file which comply with this requirement is given in Annex B. The CIPO application is open to public inspection. CIPO has received a request for examination, but has not begun substantive examination of the application. Substantive examination is considered to have begun when CIPO issues a first office action (i.e. : an examination report or a notice of allowance). If the work products are available, in English or French, on the respective OEE online networkFootnote 2, CIPO will retrieve the office actions. If the work products are not available in English or French on the respective OEE online network, a copy of the OEE actions must be attached with an accurate translation in English or French, if applicable. If the claims are available in English or French on the respective OEE online network, CIPO may be requested to obtain them electronically. If the claims are not available in English or French on the respective OEE online network, claims must be provided with the PPH request, including an accurate translation in English or French, if applicable. 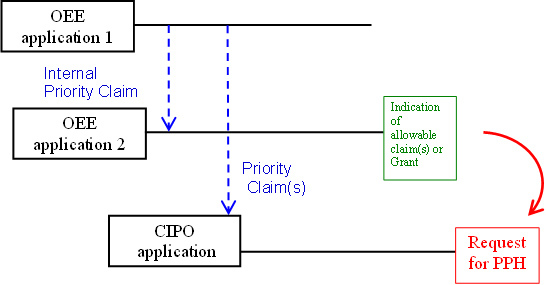 A completed claim correspondence table showing the relationship between the claims of the CIPO application and the allowed OEE claimsFootnote 2. In addition, applicant should notify CIPO of any office actions from the OEE that are relevant to patentability and issued after submitting a PPH request, wherein the OEE has reversed a prior indication of allowability. Further, if the office actions cannot be retrieved by CIPO, they should be submitted with the notification. If it is impossible for the patent examiner to understand even the outline of the translated office action(s) or the scope of the translated claims, due to inadequate translation, the examiner can request that the applicant resubmit a translation. Patent documents (where not publicly available) and non-patent literature cited by the OEE may be provided with the request. While provision of these documents is optional, it may further accelerate examination. Applicants may file translations of citations as part of the supporting documentation when initially requesting accelerated examination under the PPH to allow prompt consideration of the citations, if they so desire. The CIPO Examiner may request translation of citations using the standard CIPO examination procedure where translation of a cited document is necessary. The applicant need not provide further copies of documentation if they have already submitted the documents noted above to CIPO through simultaneous or past procedures related to the application. The applicant files a completed PPH request form and the relevant supporting documents, as noted above. The request for examination under PPH may be made by mail, fax, or electronically via the Innovation, Science and Economic Development Canada website as per the CIPO patent correspondence procedures. The PPH request form must be the uppermost document to ensure that the request is correctly processed. The PPH request form is available online at the CIPO PPH website for the respective agreement. All subsequent correspondence with the office must be clearly identified as relating to a PPH application to ensure that the correspondence is correctly processed. Please prominently mark each page of the covering letter in subsequent correspondence with the term "PPH". The request for accelerated examination under the PPH must also be accompanied by, or preceded by a request for examination. If the CIPO application is not open for public inspection at the time of request, the applicant must authorize that the application be made open for public inspection. It is recommended that when requesting accelerated examination under the PPH, applicants should not only focus on the claims but on the application as a whole. The applicant should review the complete application and amend the application to correct known informalities that result from the differences between CIPO and OEE patent application requirements. These informalities include defects such as a statement that incorporates by reference another document (section 81(1) of the Patent Rules ), and reference to documents that are not available to the public (subsection 81(2) of the Patent Rules ). The PPH request will be considered by an Examiner, and, if all requirements are met, the Examiner will conduct the accelerated examination. Each Canadian patent application will be examined in accordance with the Canadian Patent Act and Patent Rules , and CIPO's Patent Office Practice. If the Examiner determines that the claims on file do not sufficiently correspond to one or more of those claims indicated as allowable in the OEE, the applicant will be notified that the request for accelerated examination is not granted. To re-enter the PPH, the applicant must amend the claims accordingly and reapply altogether. At any time during the prosecution of a PPH application, if the Examiner determines that the claims on file do not sufficiently correspond to one or more of those claims indicated as allowable in the OEE, the applicant will be notified that the application will await action in its regular turn. All amendments to the claims made with the request for accelerated examination under the PPH will be entered regardless of whether the request is granted or not. Description of Example A A nationally filed application at CIPO validly claims priority under the Paris Convention from an Office of Earlier Examination (OEE) national application which has an indication of allowable subject matter or has granted as a patent. A PPH request is made for the nationally filed application at CIPO, based on the indication of allowable subject matter in the OEE or the OEE granted patent. Description of Example B PCT international application is filed and enters national phase at CIPO. The PCT application validly claims priority from an OEE national application which has an indication of allowable subject matter or has granted as a patent. A PPH request is made for the national phase application at CIPO, based on the indication of allowable subject matter in the OEE or the OEE granted patent. Description of Example C A nationally filed application at CIPO validly claims priority under the Paris Convention from two earlier applications: an OEE national application and a national application filed at any office. The OEE national application has an indication of allowable subject matter or has granted as a patent. A PPH request is made for the nationally filed application at CIPO, based on the indication of allowable subject matter in the OEE or the OEE granted patent. Description of Example D A nationally filed application at CIPO validly claims priority under the Paris Convention from an OEE national application which has an indication of allowable subject matter or has granted as a patent. A PPH request is made for a divisional of the nationally filed application at CIPO, based on the indication of allowable subject matter in the OEE or the OEE granted patent. Description of Example E A nationally filed application at the OEE validly claims priority under the Paris Convention from a CIPO national application. The OEE national application has an indication of allowable subject matter or has granted as a patent. A PPH request is made for the nationally filed application at CIPO, based on the indication of allowable subject matter in the OEE or the OEE granted patent. Description of Example F A PCT international application is filed and enters national phase at the OEE. The OEE national phase application has an indication of allowable subject matter or has granted as a patent. The PCT application validly claims priority from a CIPO national application. A PPH request is made for the national application at CIPO, based on the indication of allowable subject matter in the OEE or the OEE granted patent. Description of Example G A nationally filed application at the OEE validly claims priority under the Paris Convention from two earlier applications: a CIPO national application and a national application filed at any office. The OEE national application has an indication of allowable subject matter or has granted as a patent. A PPH request is made for the nationally filed application at CIPO, based on the indication of allowable subject matter in the OEE or the OEE granted patent. Description of Example H A nationally filed application at CIPO validly claims priority under the Paris Convention from OEE national application 1. OEE national application 2 validly claims internal priority from OEE national application 1 and has an indication of allowable subject matter or has granted as a patent. A PPH request is made for the nationally filed application at CIPO, based on the indication of allowable subject matter in the OEE or the OEE granted patent. Description of Example I A nationally filed application at CIPO validly claims priority under the Paris Convention from an earlier national application filed at any office. 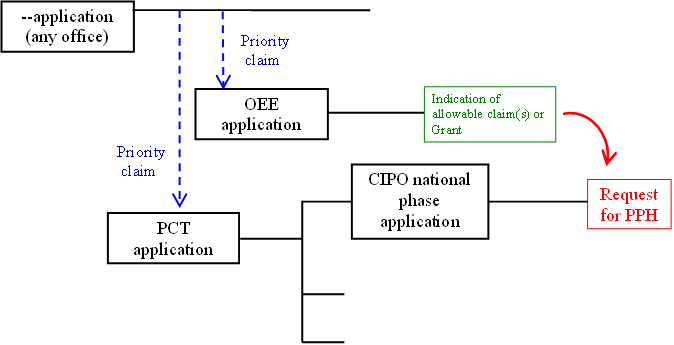 An OEE national application claims priority to the same earlier application and has an indication of allowable subject matter or has granted as a patent. A PPH request is made for the nationally filed application at CIPO, based on the indication of allowable subject matter in the OEE or the OEE granted patent. Description of Example J A PCT international application is filed and enters national phase at CIPO. The PCT application validly claims priority from a national application filed at any office. 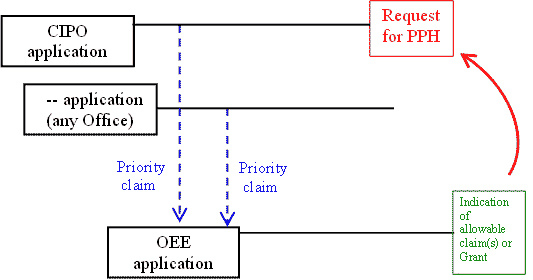 An OEE national application claims priority to the same earlier application and has an indication of allowable subject matter or has granted as a patent. A PPH request is made for the national phase application at CIPO, based on the indication of allowable subject matter in the OEE or the OEE granted patent. Description of Example K A PCT international application is filed and enters national phase at CIPO and the OEE. The PCT application validly claims priority from a national application filed at any office. The OEE national phase application receives an indication of allowable subject matter or is granted as a patent. A PPH request is made for the CIPO national phase application, based on the indication of allowable subject matter in the OEE or the OEE granted patent. Description of Example L A PCT international application is filed and enters national phase at CIPO and the OEE. The national phase OEE application receives an indication of allowable subject matter or is granted as a patent. The PCT application validly claims priority from an earlier PCT application which has no priority claims. A PPH request is made for the national phase application at CIPO, based on the indication of allowable subject matter in the OEE or the OEE granted patent. Description of Example M A PCT international application is filed and enters national phase at CIPO and the OEE. The PCT application has no priority claims. The OEE national phase application receives an indication of allowable subject matter or is granted as a patent. A PPH request is made for the CIPO national phase application, based on the indication of allowable subject matter in the OEE or the OEE granted patent. 1 A 1 (independent) A The same as OEE claim 1. 2 A + a + b 2 (dependent on 1) A + a Claim 2 has the additional feature "b" in relation to OEE claim 2. 3 A + d N/A N/A Claim 3 has an additional feature "d" in relation to OEE claim 1 (where "d" is supported in the description but is not claimed in the OEE). Where "A" is the subject matter and "a", "b", and "d" are the additional features which narrow (further restrict) the scope of the subject matter. A CIPO claim which introduces a new/different category of claims to those claims indicated as allowable in the OEE is not considered to sufficiently correspond. For example, the OEE claims only contain claims to a process of manufacturing a product, then the CIPO claims are not considered to sufficiently correspond if the CIPO claims introduce product claims which are independent or dependent on the corresponding process claims. Please note that it is not necessary to include "all" claims determined to be allowable in the OEE in an application in CIPO (the deletion of claims is allowable). For example, in the case where an application in the OEE contains 5 claims determined to be patentable/allowable, the corresponding application in CIPO may contain only 3 of these 5 claims. 1 to 5 1 to 5 Applicant has amended the claims to the present claims having the same scope as the claims of the applicant's corresponding OEE application. OEE claims 1 to 5 have been indicated as allowable in the notice dated . 1 to 3 1 to 3 Applicant has amended the claims to the present claims having the same scope as the claims of the applicant's corresponding OEE application. OEE claims 1 to 3 have been indicated as allowable in the Office action dated . If the OEE office action does not explicitly state that a particular claim is allowable/patentable, the applicant must include an explanation accompanying the request for participation in the PPH pilot program that no rejection has been made in the OEE office action regarding that claim, and therefore, the claim is deemed to be allowable/patentable by the OEE. A sample claim correspondence table is given in Annex C.